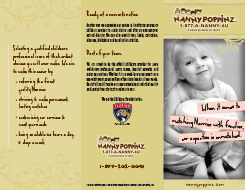 If you are interested in a successful career as a Nanny while making a difference in the lives of San Francisco Bay Area California area families, then Nanny Poppinz has the job for you! Since 1992, Nanny Poppinz has helped thousands of Nannies find jobs with families who appreciate true quality childcare. Additional Requirements:: Family wants to meet nanny via skype before dates of care and wants same cg for all 3 days (female only!) The client has lots of flexibility and would like someone to fill all day but is totally open to any block of hours a caregiver could commit to. Additional Requirements:: Hello! I am a resident physician at UCSF, working with a group exploring options to provide emergency childcare for women who require hospitalization. I would love to set a time to speak with someone from your group about how you work, your rates, and whether you ever partner with large organizations to provide backup care. Additional Requirements:: Parking is in the street. Additional Requirements:: Reason: Parent Unavailable Pets: None Parking: Yes Public Transportation: Yes Driving Required: Yes Vehicle Provided: No Family's Comments: This will be a recurring booking for April 22, 23, 25, 26, 29, 30, May 1, 2. The caregiver will need to walk 2-3 blocks each direction to pick George up at school each day. Additional Duties: Typically, this will involve a regular parent's night out (8 to 10 hours on a Saturday night). We also will need occasional overnight care for business trips that can occur on either weekdays or weekends. Additional Requirements:: Driving is not required. 1 CG only. Additional Requirements:: Reason: Child care Unavailable Pets: none Parking: Yes Public Transportation: Yes Driving Required: No Vehicle Provided: No Family's Comments: The toddler only knows Hindi yet, so we are looking for someone who can speak Hindi, but it's not an absolute deal breaker. Additional Requirements:: NLT 2 pm. Additional Requirements:: We are looking for approximately 8-10 in-room sitters for the evening of Saturday, November 2, 2019 at Carmel Valley Ranch. The sitters would be watching children who are 2 years of age and under for dinner and evening activities (not all night). Location: San Francisco, CA, ..
Additional Requirements:: Interested in bilingual nanny, if possible, as well as nanny share. Please email with information. Would a 4/15/19 start date be available for a nanny share? Pet Description: Very friendly, non shed. We have a yard where he can relieve himself throughout the day, and can be crated if nanny wants to take kids out of the house.